Good morning sunshines! At least it's the morning for me. In case you're in other part of the world then I hope you're having a nice day or night. It's been a long time since I talked to you guys but I find it really difficult to come up with new posts because I'm really into my work and I have loads of stuff to do everyday. But well, that's not the topic today. Today I'm doing a different post from all the others I use to do and it's a very special one and I am over excited for it. Writting this and sharing with you guys all those words makes me happy. So let's get started. 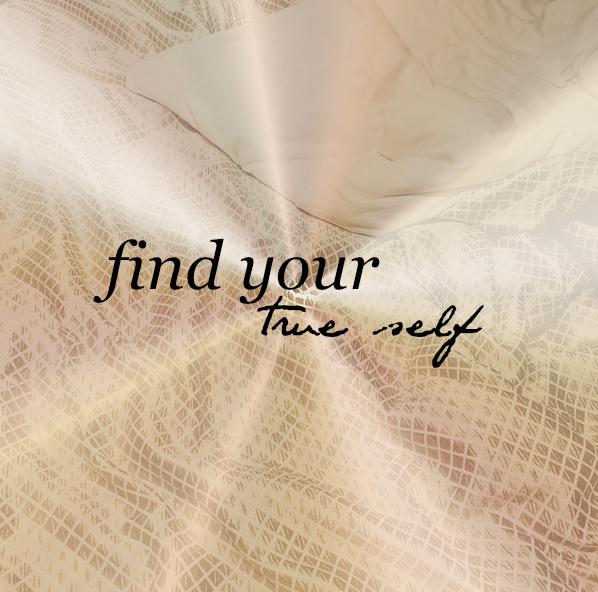 Find your true self, that's the title. Finding your true self. Maybe you're wondering what am I talking about. Recently, I've come to a realization and that was that I wasn't truly happy. Neither I was sad or incomfortable with my life because I have a family, a great boyfriend and a job that fills me up and you can't imagine how grateful I am everyday for having them. So I wasn't unhappy, that's not the point about this post. I got completely aware that I wasn't being myself at all, that I didn't feel "complete", that I wasn't being myself to the fullest. I don't really know how to explain this, it's kind of difficult to find the right words to express it as I felt it. Maybe some of you felt or are feeling the same way as I do so you can understand perfectly. In that moment I experimented what is called an "enough epiphany". I thought to myself: <<I'm done. I have to do something to change this because I'm wasting my time being the 50% that I can be.>> And the change began there. Changes aren't easy or fast. Changes take time and effort and a really strong mind. But we all can develop them. I didn't exactly know what to do after the enough epiphany so I decided to start doing things that I have never done and others that I used to love but that I don't do them often now. So I started my yoga journey, bought a book (Adventures for your soul, by Shannon Kaiser) and accepted a proposal in the work which is a challenge for me. Because I think that if you wanna find your true self it's essential to challenge yourself everyday. When you do it, when you do things that are hard or that you've never done before, you're increasing your motivation, your positivity and your self love. Which makes your mind and body more balanced. This is the path for being the best version of you that you can possibly be. I bet you're wondering when did I start living this way. Well, I'll answer you: a week ago. Yes. I started my yoga journey last week and I already feel more comfortable in my own body and mind. I have back problems and I use to be in pain almost everyday and doing yoga is helping me a lot with it. Also I feel more in peace and relaxed. The book that I told you a few lines before is doing its job too. I'm completely loving it and I've only read the introduction and one chapter. I find Shannon's words really helpful and motivational. I highly recommend it honestly. So that is it. It isn't as difficult as it seems, the hardest part is having the determination to start a change. The rest comes after, believe me. It's a long journey as I said at the beginning, and you -and I, of course- will have ups and downs through it. But that's what life is about, isn't it? We have to be grateful for everything good that we have or that happens to us and try to live our lifes in the best way we can. Take time to yourself, don't live for others, live along with others but only for you. If you do this, you'll end up being the best version of you and that will make you happy and the people who is in your life will appreciate it. And if they don't, just let them go. We all need positivity and support, and there's people who doesn't give that to us. In that case, go and find others that are capable of fit into the balance and love you for who you are, not for who they want you to be or for what they want you to do. Getting to this point I'm wondering if I'm rambling and if this words will be helpful for someone out there. I don't know. Maybe yes and maybe not. But they were helpful for me when they sounded in my head so why wouldn't be them the exact thing somebody needs to jump and start living the life they want? I hope that happens. It would made me truly happy. Well guys, I think I'm ending this post here. Honestly, I'd really appreciate if you could tell me your thoughts on this and if you would like me to start working on more posts dedicated to these topics. I accept suggestions too. By the way, this was only a little part of what's in my head, so if you feel the need to talk about something related to this and if you have any doubt or thing that you can share with me, don't you hesitate and contact me.
. We can talk there or even share phone numbers if you have imessage or whatsapp. Doing yoga also makes me feel better, both mentally and phisically. But I've never tried with meditation yet. Thank you for the feedback beaut. xoxo. It's a good post. Thank you for sharing this with us. And I wanna tell you that you are a fashion beauty.